The typical beauty consumer applies 150 different ingredients to his or her face each and every day (Figaro, 2017). In today’s environment of increasing transparency and accountability, consumers want to know the risks they incur when they apply products to their face or body. Where “green” or “natural” used to be the key buzzwords, today we see more and more products moving to “clean beauty” where naturality is good, but safety is paramount. Still a recent concept in beauty, “clean” is an idea that originally began in the food industry and moved into personal care with the introduction of slow beauty, which goes beyond natural and focuses on conscious consumption. Not to be confused with “natural” or “organic”, the term “clean” refers to products formulated without so-called harmful ingredients such as parabens, phthalates, or even retinol. Consume smarter, respect the environment, monitor what we use: many people today pay more attention to their well-being, but also to their impact on the planet, than ever before. Consumers are already well tuned to transparency, environmental and safety concerns when talking about food, sport, or wellness, and their increased awareness is rubbing off on their cosmetic consumption. In other words, today’s consumer wants to take back the reigns of their beauty routine and put common sense and understanding into it. The hashtags #eatclean or #healthyeating are already widely used on Instagram, but #cleanbeauty isn’t far behind – with 813,000 posts as of July 2018. A growing segment of consumers are looking for natural beauty products – natural ingredients, claims, and labels continue to grow in prevalence and popularity. But clean goes is a similar but different direction. With a positioning that sits between ethics and safety, the target for this claim is huge, even universal – since all consumers of cosmetics want and expect safe products. And major retailers like Sephora are jumping on board. Sephora has recently launched “clean at Sephora” which identifies certain products as being “they beauty you want, minus the ingredients you don’t”. Brands that are granted the “clean at Sephora” seal must be free from SLS, SLES, parabens, formaldehydes, phthalates, mineral oil, retinyl palmitate, oxybenzone, and more. They must also contain less than 1% of synthetic fragrances. It’s the no-no list taken to the next level. For all but the most knowledgeable consumers, the INCI listing remains largely indecipherable. To assist consumers in their purchasing decisions, many apps have emerged promising to decode the composition of all kinds of products from home cleansers to skin care. By scanning a product’s bar code, the consumer can have an immediate assessment of the supposed danger or safety of the product and a run-down of the controversial ingredients or allergens it contains. Just as Shazam lets us recognize the title of any song we hear, in one click these apps let us know if a product is good for our skin and health. It’s important to note that these apps are controversial due to the sometimes questionable scores they provide, but it’s equally important to realize that many consumers are relying on this information for clarity in what they consider a murky situation. The Environmental Working Group (EWG) is a non-profit organization that strives to “protect human health and the environment”. As part of these efforts, the group has created a ranking system for cosmetic products and ingredients, designed to reflect potential health hazards. The ranking system goes from 1-10 with a rating of 1-2 considered as low hazard (green). The EWG ranking has rapidly gained interest in certain markets, particularly in Asia, where the claim “EWG Green” has become increasingly important. Additionally, many companies in other markets, such as the US, are also turning to EWG as a basis for the creation of clean products and formulations. 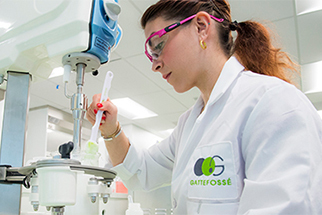 Gattefossé ingredients are well positioned to meet both the natural and clean beauty movements. Many of our textures and actives are both natural and EWG green, meeting the needs of both markets. For a complete list of our natural and EWG Green ingredients, click here.